The amount of scrapbooking supplies you need to begin scrapbooking isn't very much. As you get more familiar with the process you can begin to add some of the more fancy tools if you like. I am just going to describe the essentials that I believe every scrapbooker should have. My personal favorite are the simple three ring binder albums. I remove the card stock pages they come with and add a bunch of sheet protectors which I buy at the scrapbook store. I choose this method because I am an avid scrapbooker. I scrapbook all my photos, in chronological order. I end up with at least four scrapbooks for one year. I need a flexible, economical solution, that still works well. If you are making a scrapbook for a special occasion, you may want to buy another type. There are many different types of scissors you can buy, but you definitely need regular ones too. The fancy edge scissors are used to add a unique edge to your photos or any paper you may add for a tag to your pages. They are nice to have, but some people don't like the look and prefer clean edges on their photos. 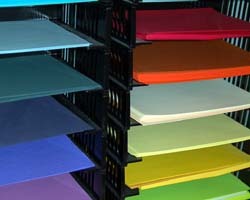 It is essential to buy a pack of multi-colored 8.5"x11" card stock. This is used to mat your photos, and create tags and blocks to add journaling. If you use an 8.5"x11" scrapbook album the card stock can also be your background you glue the photos to. 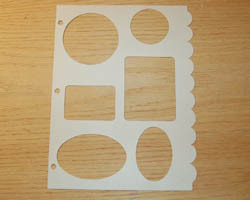 This is used to "crop" your photos and make shapes out of card stock for titling and journaling. Pick a template with circles, ovals, squares, and rectangles. You will need a good set of thin markers to journal and make titles, or use your computer's printer to print out titles. There's a ton of scrapbooking supplies you can buy! Before you know it a page could end up costing $5 or more! No embellishments are really necessary to scrapbook, just personal preference. Don't get overwhelmed if you are just beginning. As you get more good at it you may want to buy some of the fancy stuff. I f you are going to buy one thing, start with stickers. Stickers related to your theme are always nice and can really add to a page.